I’ve just finished a two week project in Whitechapel for English Heritage, with Year 6 at Canon Barnett Primary School. Equipped with sketchbooks, the class have been walking and drawing the built heritage of the area, as well as making collages, seeing behind the scenes at the renovations at Altab Ali park, and making a presentation to professionals from English Heritage and Tower Hamlets council about which local features they would like to see listed. We also visited the Ian Berry photography exhibition at Whitechapel Art Gallery, which is practically next door to the school. It’s been a very enjoyable project and the next step is for me to design then screen print a poster with the children’s drawings, which we will present to the chair of English Heritage in July. Looking forward to going back already. 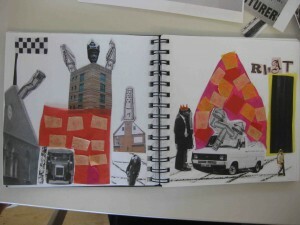 This entry was posted in collage, drawing, General news, Workshops on May 27, 2011 by Jane Porter.